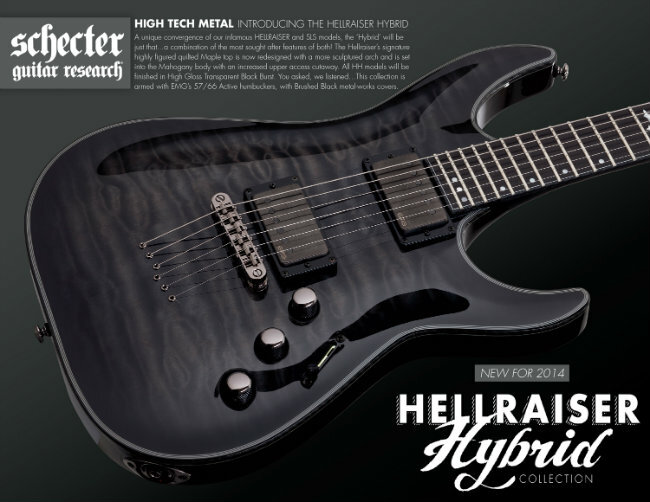 Schecter is proud to announce to debut of the much-anticipated HELLRAISER HYBRID COLLECTION. A unique fusing of our infamous HELLRAISER and SLS models, the Hybrid will be just that; a combination of the most sought after features of both! The Hellraiser’s signature highly figured quilted Maple top is now redesigned with a more sculptured arch and is set into the Mahogany body with an increased upper access cutaway. All HH models will be finished in High Gloss Transparent Black Burst. This collection is armed with EMG’s 57/66 Active Humbuckers with Brushed Black metal-works covers. The HH C-7 and C-8 versions also use USA made Hipshot Non-Trem bridges to accommodate progressive playing styles. The SLS shares its popular thin, fast neck profile and satin finish. The compound radius ebony fiberboard is adorned with an ‘inverted’ dot pattern; switching to the treble side at the 15th fret. The Metal Cross, synonymous with the Hellraiser sits proudly at the 12th fret. A newly designed ‘Carbon fiber’ binding and glow-in-the-dark side dots (great for low light live situations) are a great addition to the 2014 Hellraiser Hybrid’s “Hi-Tech-metal’ look. This collection will also mark the return of the Tempest!